Here ended the text of my 2013 draft, with photographs already lined up for me to narrate the rest of the story. I’ll do the best I can to fill in the details five years later. 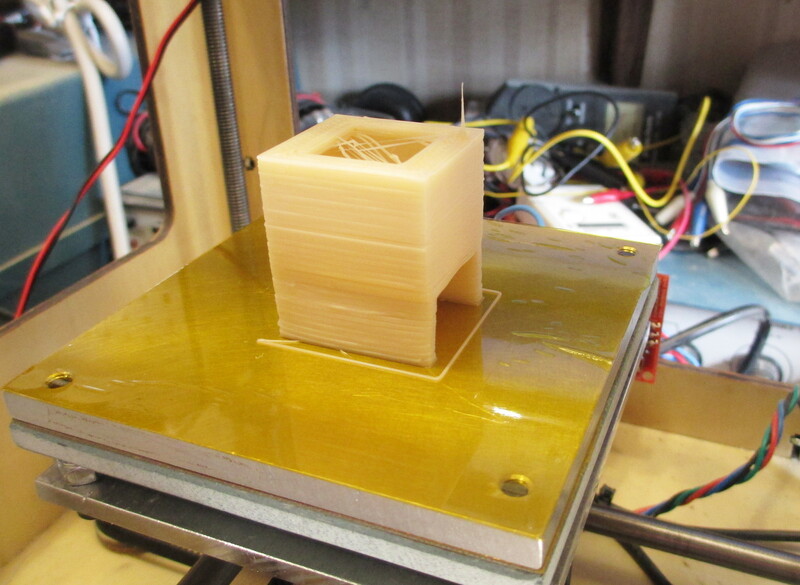 The toothbrush had worked well for Joel but I was leery of it only cleaning two sides of the filament, so I wanted to run the filament through a hole or slot in a sponge. I designed a sponge holder in OpenSCAD that would sit on top of the CupCake extruder. 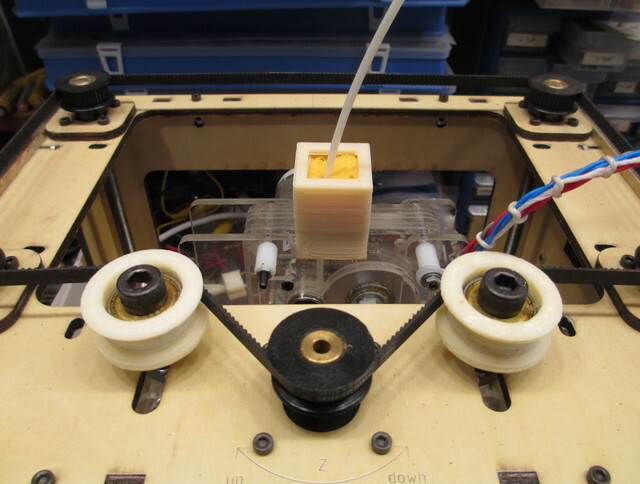 It’s not fastened in place — the legs keep it sitting on top; the filament keeps it from sliding side to side; and the filament pulls it down onto the extruder. The occasional filament reversals never push it far upward. 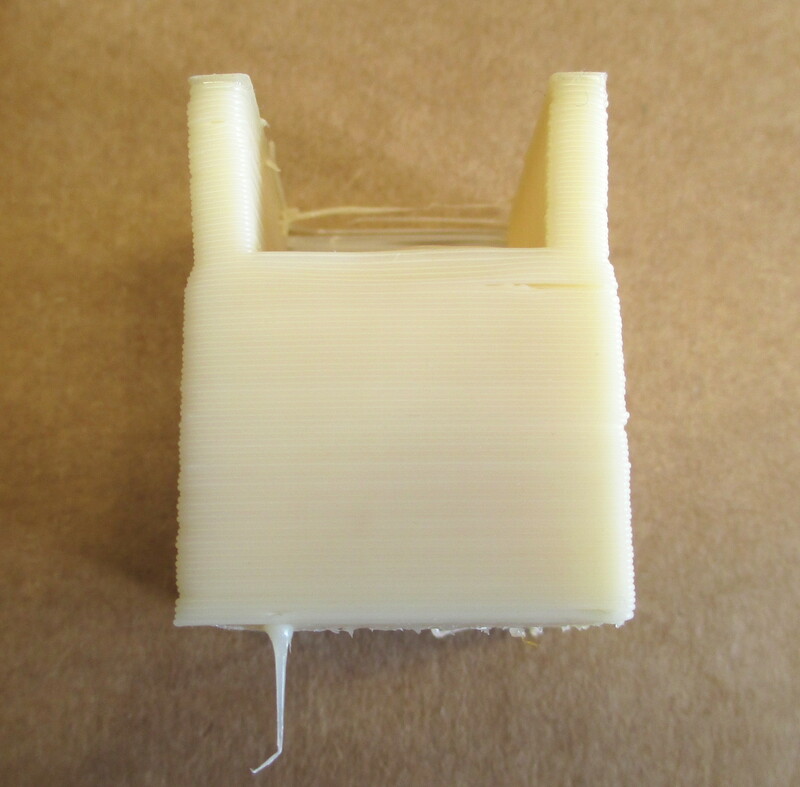 Since my extruder nozzle was at that moment passing filament, I was able to print the part myself. From the first picture in this post and the string at the bottom of this one, you can see that I printed it in the opposite orientation from the photo — printed in the orientation in which it’s used — because my printer has always been reasonably good at bridging, so I wasn’t worried about it. Still probably would have been smarter to print it upside-down anyway. In this picture, you can see foreshadowing of a future post — the sponge holder’s legs are warped inward. That occurred because the first layers of the body cooled so rapidly that they shrank while the remainder of the body was still being printed — the same issue that causes corners and edges of people’s bases to pull away from build platforms that aren’t super-sticky. 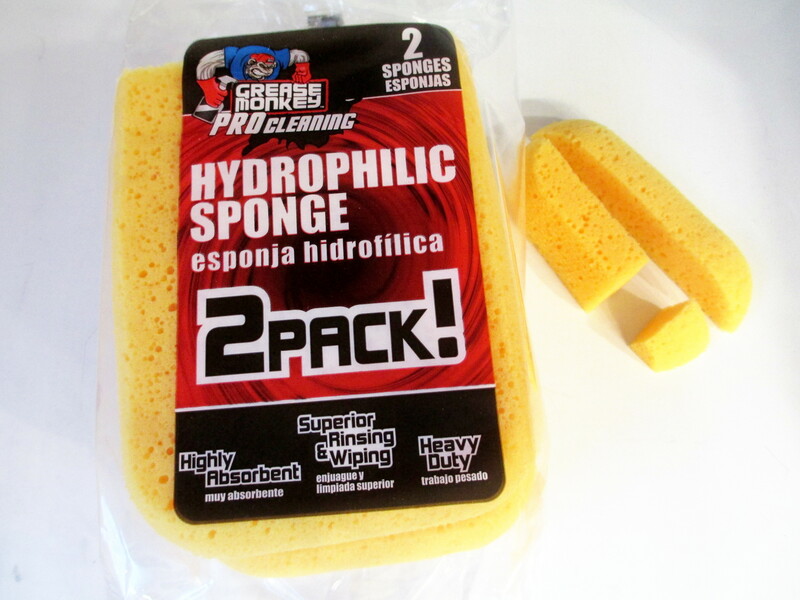 I had an unused carwash sponge on hand, so I sliced it with a sharp knife, then cut a cube to fit inside the holder. I think I poked a hole through the center with an awl, but it’s possible I sliced in from the edge to provide a path to load the filament. And I’ve had no further problems with nozzle clogs since then! Which sounds sarcastic since I only used it another month before not touching it for five years … but really, this did solve my clogging problem, and it was evident that it had done so during the remaining time I was actually using it. I’d had frequent mini-clogs and occasional maxi-clogs prior to the filament cleaner, and none since. This entry was posted on Friday, June 22nd, 2018 at 01:15 pm	by Keith Neufeld	and is filed under MakerBot CupCake. You can follow any responses to this entry through the RSS 2.0 feed. You can leave a response, or trackback from your own site.